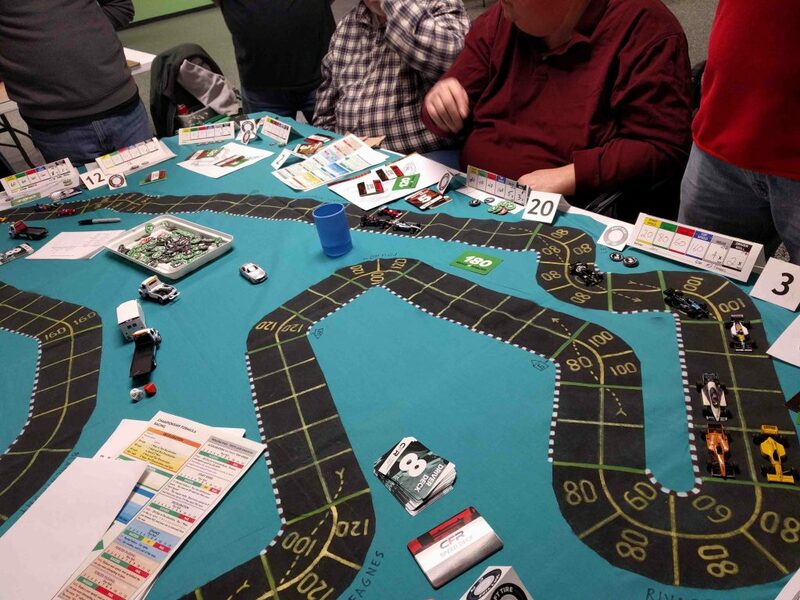 On Friday, December 8, 2017, the Belgian Grand Prix was contested at Pandemonium Games in Garden City, Michigan. 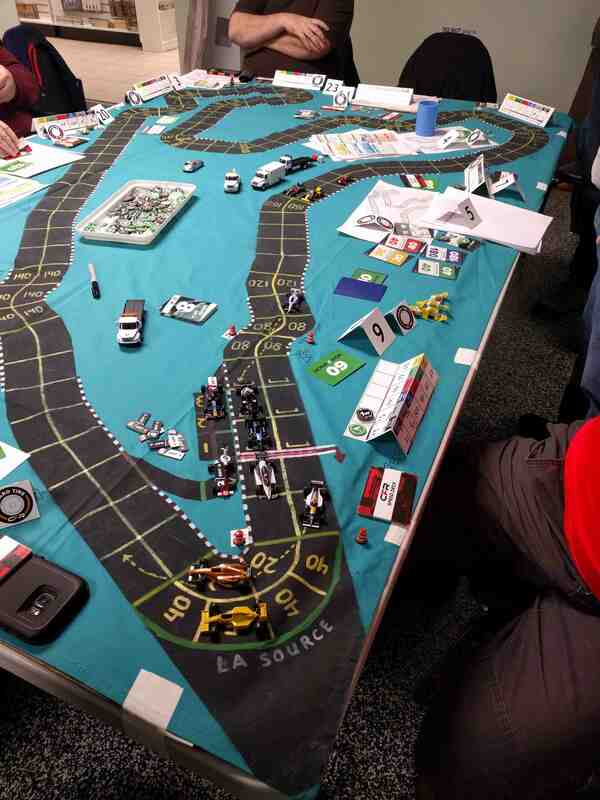 Twelve drivers competed on the Spa-Francorchamps track using the Championship Formula Racing (CFR) Rules. Mike Cook won the race from the pole position; it was his second consecutive victory and enabled him to take over the points lead. Joining Cook on the podium were Richard White (2nd place) and Garry Kaluzny (3rd place). 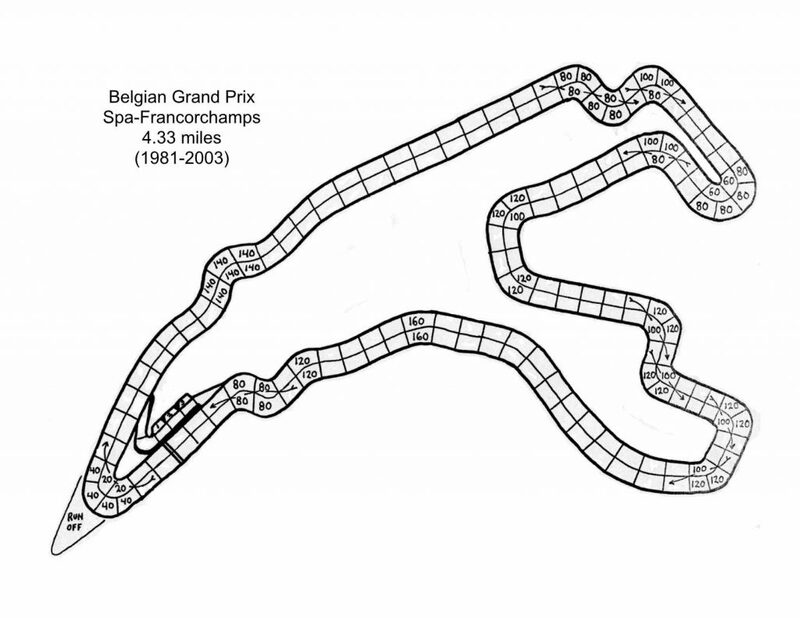 The Spa-Francorchamps track used with CFR, from the 1980s. 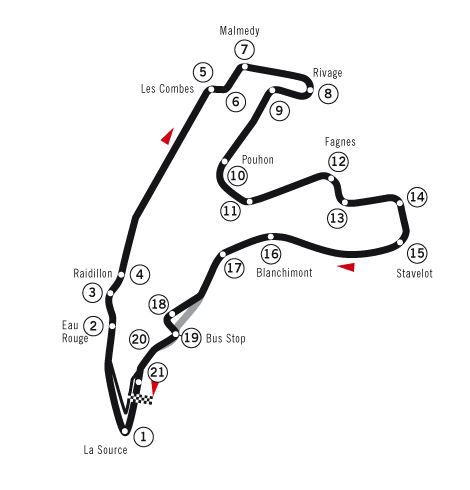 The Spa track is a bit unusual, in that it has the slow La Source hairpin turn right after the start-finish line. Any car that can get through that turn first at the start of the race has a big advantage over following cars. 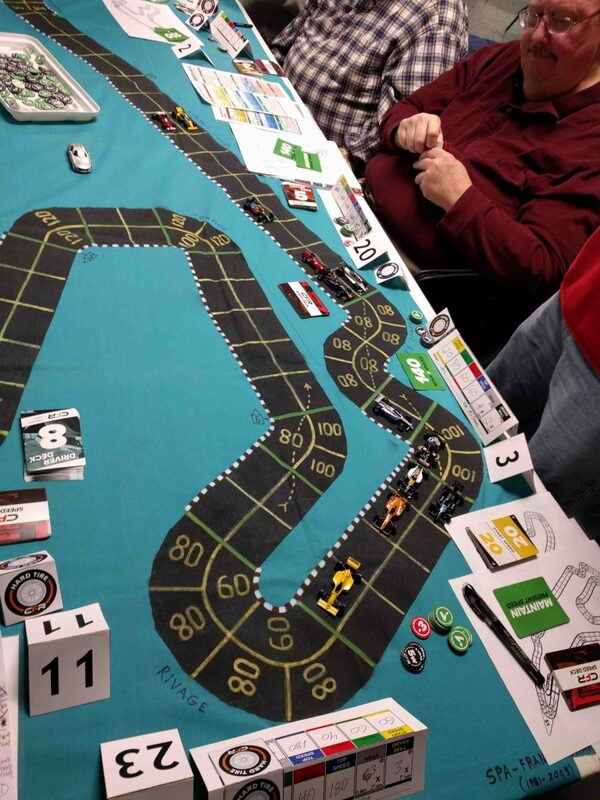 That being said, Mike Cook (1 wear and 9 skill) and Garry Kaluzny (5 wear and 1 skill) both bid 5.5 for the pole position, with Cook earning the pole by a better dice roll than Kaluzny. (Note: Qualifying order in CFR is determined by how much a driver secretly bids, using his wear and/or skill markers. Each wear counts as a bid of 1, and each skill is 0.5. Any ties are resolved by dice rolls) Greg Lim and Gary Sturgeon each bid 4, each bidding 1 wear and 6 skill. Lim won the resulting dice roll, so he started 3rd and Sturgeon was 4th. Jim Robinson started 5th, with a bid of 3 (2 wear & 2 skill). 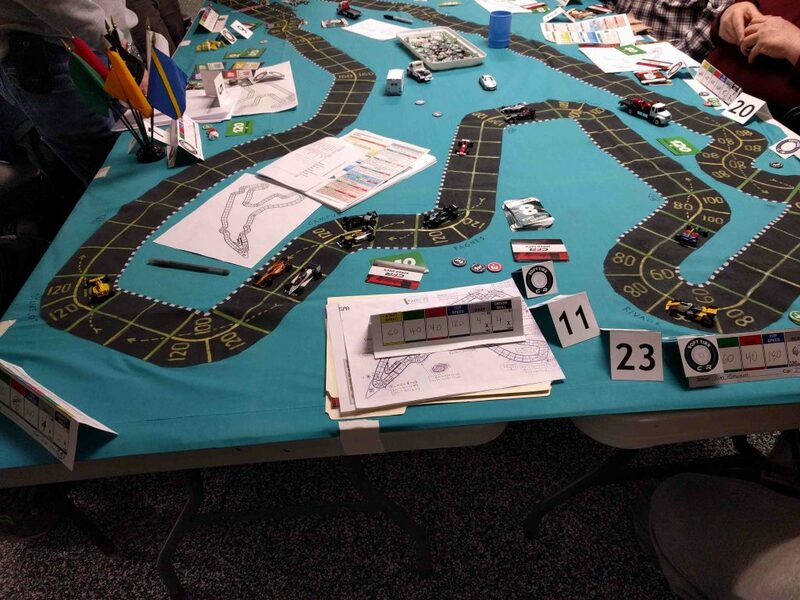 Four drivers bid 2.5, and started in this order after the resulting dice rolls: 6th place was Brian Robinson (0 wear & 5 skill); 7th place was Richard White (2 wear & 1 skill); 8th place was rookie Chad Marlett (1 wear & 3 skill); 9th place was another rookie, Gary Kempen (2 wear + 1 skill). Jack Beckman started 10th with a bid of 1.5 (1 wear & 1 skill), Jim Landis started 11th with a bid of 1 (0 wear and 2 skill), and Russ Herschler started in 12th after he bid zero. At the start, Garry Kaluzny automatically boosted his starting speed to 80 mph without having to roll dice as his car had started on soft tires. Mike Cook, who started on hard tires, had to roll to increase his starting speed to 80 mph, and he successfully made the roll. Therefore, the pole sitter Cook moved first and took the inside lane through La Source. Kaluzny, not wanting to use forced deceleration, went around the outside to keep his speed at 80 mph. The rest of the field followed through La Source. By the time he passed through Eau Rouge on that first lap, Cook (0) had pulled out a 3 space lead. Jim Robinson (+3) and Greg Lim (0) had passed Kaluzny (-2) for 2nd and 3rd place. (The parenthesized numbers indicate how many spaces each driver gained (+) or lost (-) from the start.) Then came these drivers: 5th, Gary Sturgeon (-1); 6th, Brian Robinson (0); 7th, Chad Marlett (+1); 8th, Richard White (-1); 9th, Gary Kempen (0); 10th, Jim Landis (+1); 11th, Jack Beckman (-1); and 12th, Russ Herschler (0). As the field went through the Les Combes and Malmedy corners, Kaluzny passed both Lim and J. Robinson to regain 2nd place, and was now only 2 spaces behind the leader Cook at they approached the Rivage corner. After a few more corners, Cook stretched out his lead to 5 spaces over Kaluzny, but then led by only 4 spaces through the Fagnes corner. Most of the running order stayed the same: Cook, Kaluzny, J. Robinson, Lim, Sturgeon, B. Robinson, White, Marlett, Kempen, Landis, Beckman, and Herschler. As the field came around to complete the 1st lap, Cook touched the finish line to complete that 1st lap in 1st place, but several other cars had bunched up right behind him. Those other cars then all pulled into the pits, as they had all used up their starting wear points. Pitting were Kaluzny, J. Robinson, Sturgeon, Lim, and B. Robinson. All of those cars switched from soft to hard tires. Meanwhile, in the back of the field, Kempen tried to force a pass on Marlett, but got balked. 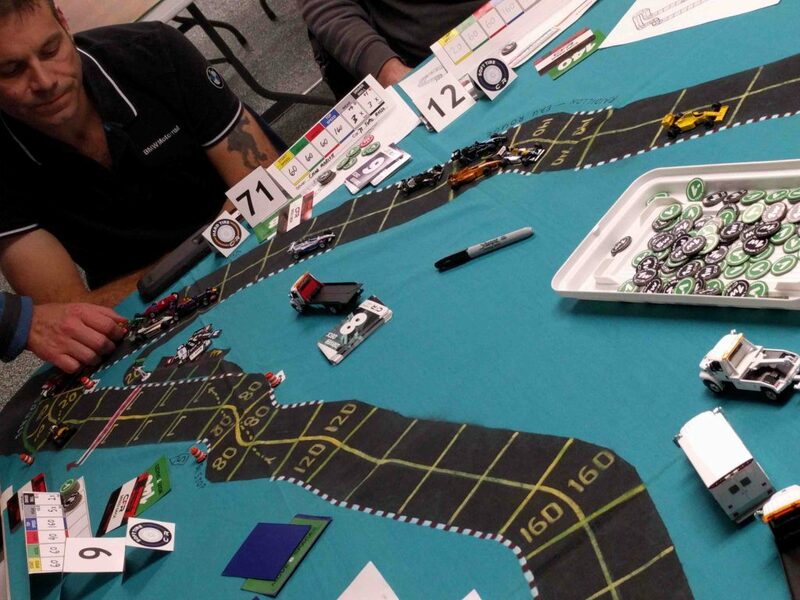 Kempen lost a wear on the failed forced pass dice roll, then had to spend his last wear and rolled forced deceleration roll (using 1 skill marker) so he could slow from 160 to 120 mph. The cars of White and Marlett didn’t pit, but stayed out on the track on their hard tires. White’s car gained 3 wear when it crossed the start/finish line, while Marlett’s car gained 4 wear. That’s the advantage of hard tires in CFR, if you don’t pit, you gain a few wear at the end of a lap. The cars of Kempen and Landis originally were not going to pull into the pits, but when they saw all of the cars that were ahead of them pull out of the pits and take up all of the track spots, then Kempen and Landis did decide to pull into the pits for new tires. In particular, Kempen really needed to pit as he had no wear remaining. Herschler also decided to pit at the end of the 1st lap. Kempen and Herschler switched from hard to soft tires, while Landis got hard tires to replace his soft tires. Beckman also stayed out on the track, and gained 3 wear when he crossed the line. The official running order for the 1st lap: Cook (0); White (+5); Marlett (+5); Kaluzny (-2); Lim (-2); Beckman (+4); Kempen (+2); Landis (+3); J. Robinson (-4); Sturgeon (-6); B. Robinson (-5); Herschler (0). The 2nd lap saw Cook hold his several space lead over White, and then White was 9 spaces ahead of Marlett. Kaluzny was battling side-by-side with Beckman’s Ferrari for 4th and 5th place, then a couple of spaces behind them came J. Robinson and Lim who were fighting for 6th and 7th place. Sturgeon was two spaces further back in 8th, then B. Robinson was another 5 spaces back in 9th place. Herschler, Landis, and Kempen brought up the rear. Cook and White maintained their lead during the 2nd lap, until finally they came around to the pits. Since they had not pitted after the 1st lap, they needed to pit, not only to change tire compounds (they both changed from hard to soft) but because both cars were out of wear. Kaluzny had been battling with the Red Bull car of Marlett for 3rd place for most of the 2nd lap, but then Marlett had to pit because he had not pitted after the 1st lap. 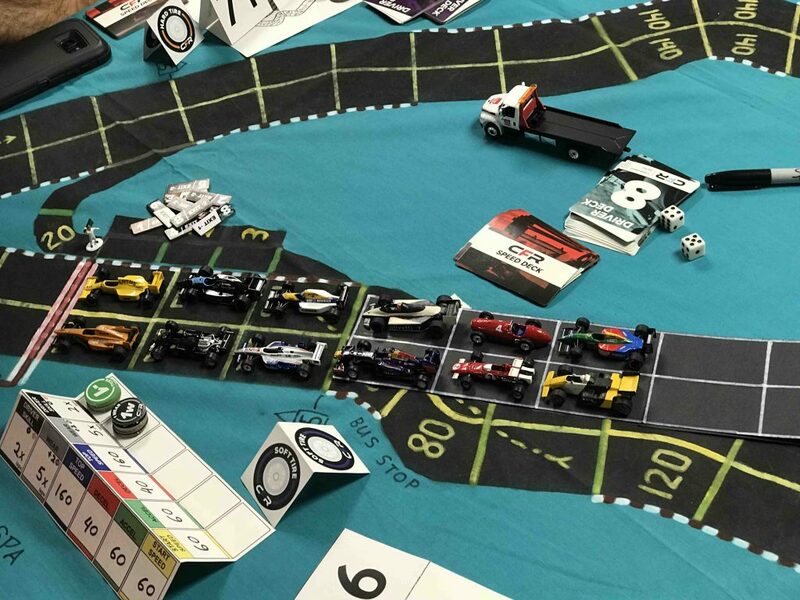 (As a side note, with the 3-lap races we run for our CFR season, cars must use both hard and soft tires at some point during the race, which means everyone must make at least one pit stop.) Kaluzny decided his only chance for victory was to stay out on the track, and try to pass Cook while Cook’s car was in the pits. Kaluzny did manage to get into the lead, but Kaluzny only had 4 wear left for the last lap, while Cook had his full complement of 12 wear after his pit stop. 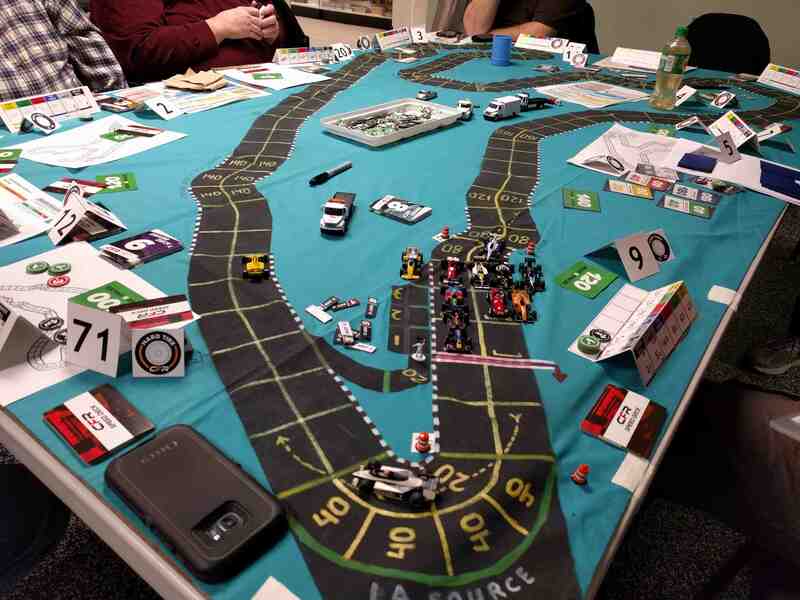 Also, at the end of his 2nd lap, Kempen failed a deceleration dice roll while trying to slow for the La Source hairpin, thus lowering his car’s deceleration to 40 mph (it had been 60 mph) for the rest of the race. After the 2nd lap, besides Cook, other cars that made pit stops were White, Beckman, and Marlett. All three of those cars switched from hard to soft tires. The official running order after 2 laps was Cook (0), White(+5), Kaluzny (-1), J. Robinson(+1), Beckman (+5), Lim (-3), Sturgeon (-3), B. Robinson (-2), Marlett (-1), Herschler (+2), Landis (0), and Kempen (-3). But after the pit stops were all sorted out, the running order on the track was Kaluzny, Cook, White, J. Robinson, Lim, Sturgeon, B. Robinson, Marlett, Beckman, Kempen, Landis, and Herschler. 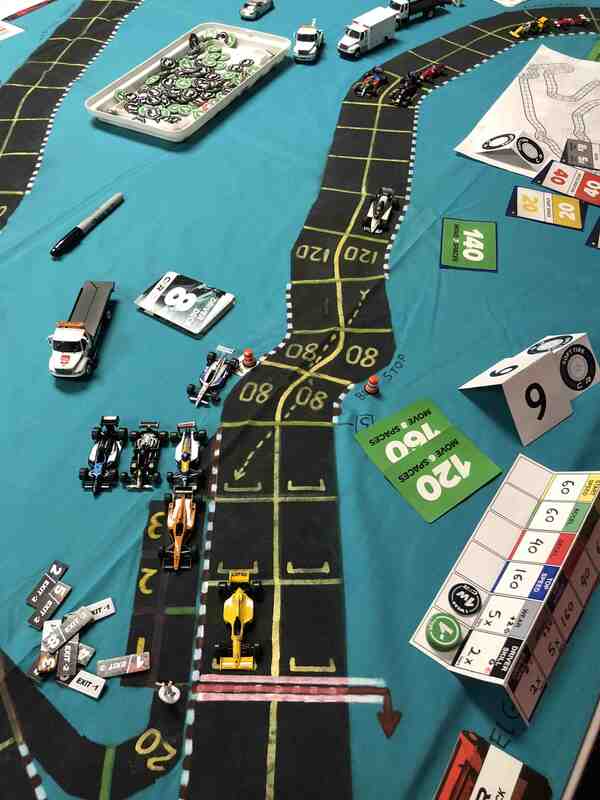 Kaluzny managed to hang on to the lead until the Rivage corner, when Cook passed Kaluzny for the lead, and White’s Brabham pulled alongside Kaluzny while coming out of Rivage. By the time Cook had reached the Stavelot corner, he had pulled out to a 5 space lead over Kaluzny and White. Then close behind, J. Robinson was battling with Sturgeon for 4th place. Lim was 6th, in the final points-paying position. Then came Beckman, Marlett and B. Robinson, then Landis and Herschler. Kempen’s race had ended when his brakes totally failed at Les Combes. Kempen thus became the only DNF, finishing 12th. During the last third of the last lap of the race around the Spa-Francorchamps track, Cook (0) cruised to an easy victory. Kaluzny and White were battling side-by-side to the end. On the final turn of the race, although he had the inside position and would have moved first in case of a tie for plotted speeds, Kaluzny only plotted 60 mph, which left him just short of entering the La Source hairpin. White plotted 80mph, which meant he did enter the La Source hairpin at 40 mph over the speed limit. White (+5) used his last wear, and rolled a chance for the corner, and he made the chance roll without spinning or crashing, which gave him 2nd place, relegating Kaluzny (-1) to 3rd place. 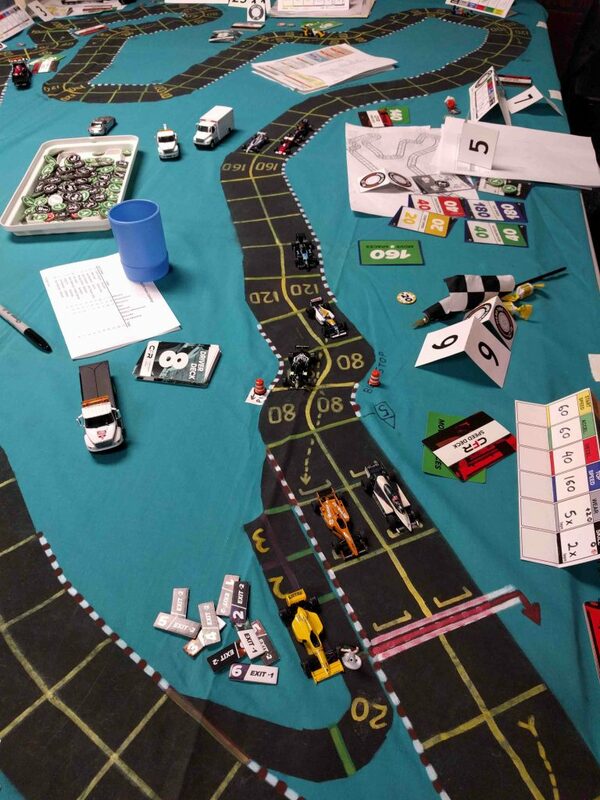 It should be noted that cars have to pay costs for entering corners after the finish line, and if a car crashes, it is considered to have not finished the race at all, and will be classified behind all other cars that do finish the race. 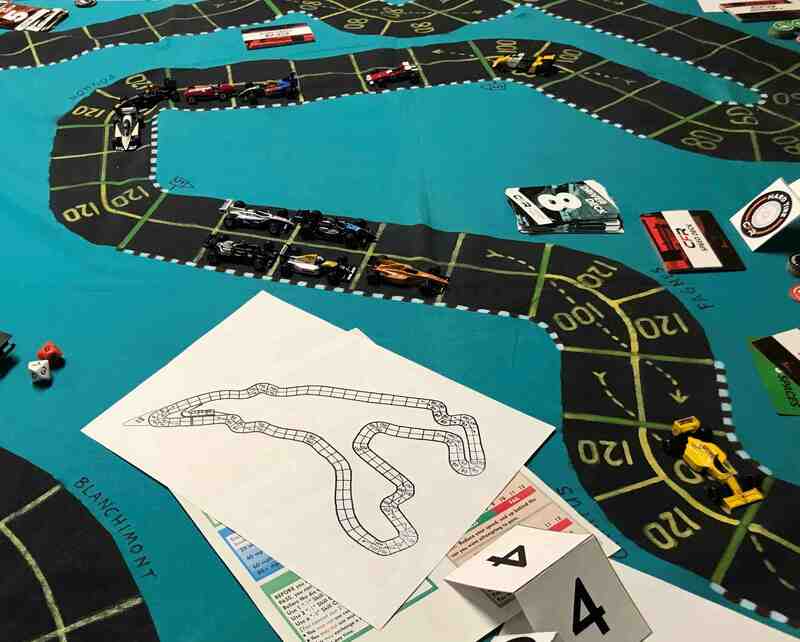 if a car spins in a corner past the finish line, it is considered to have finished the race, but will finish behind all other cars that crossed the finish line on that same turn. Finished just behind White and Kaluzny were Sturgeon (0), Jim Robinson (0), and Lim (-3), for 4th, 5th, and 6th places. Finishing out of the points in 7th through 11th places were: Brian Robinson (-1); Beckman (+2), Marlett (-1); Landis (+1); and Herschler (+1). As was noted earlier, Kempen (-3) DNFed and was classified 12th. Points awarded at the Belgian Grand Prix: Cook 10; White 6; Kaluzny 4; Sturgeon 3; J. Robinson 2; Lim 1. 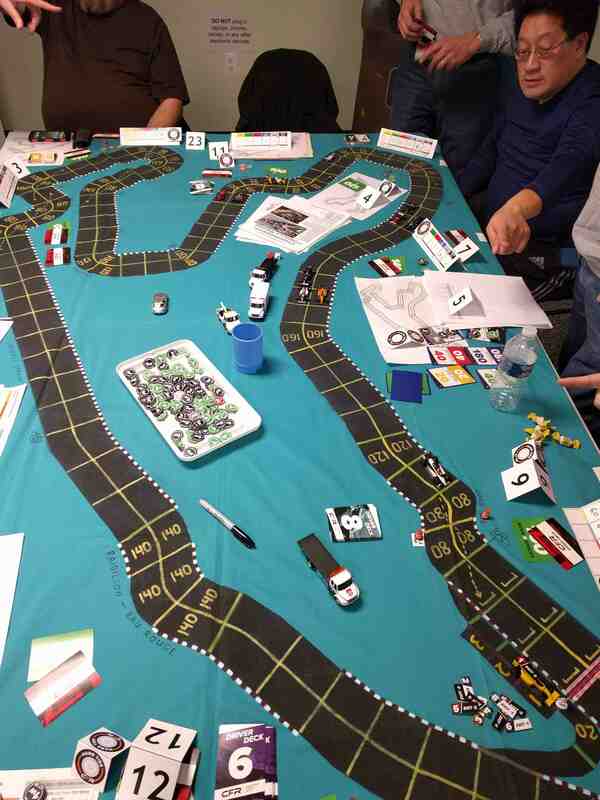 The 5th race of the season, the Detroit Grand Prix (racing on the downtown track), will be held on Friday, January 12, 2018, at RIW Hobbies & Games, 29571 Five Mile Rd (SW corner of Middlebelt Rd) in Livonia, MI. Race time is 7:00 pm, although we ask drivers to try to arrive around 6:30 pm so you have time to set up your car’s specs for the race. 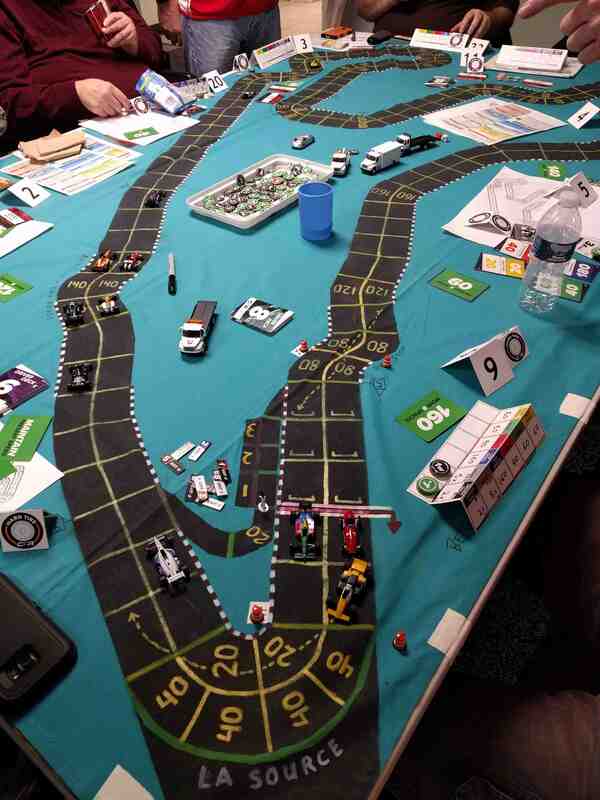 This entry was posted on Tuesday, January 9th, 2018 at 10:51 pm	and is filed under Board Games, Miniatures Games. You can follow any responses to this entry through the RSS 2.0 feed. Both comments and pings are currently closed. Nice write-up, see you Friday.